Could lovers, Elikem Kumordzie and Pokello Nare be hiding their bundle of joy? Last year it was revealed that Pokello was pregnant, explaining Elikem’s constant visits to Zimbabwe where he was often spotted buying popular wild fruit – sugar plum (mahobohobo/mazhanje) from fruit vendors in Harare. It was reported then that Pokello, because of her pregnancy, had developed a craving for the fruit and would send Elikem to buy some. 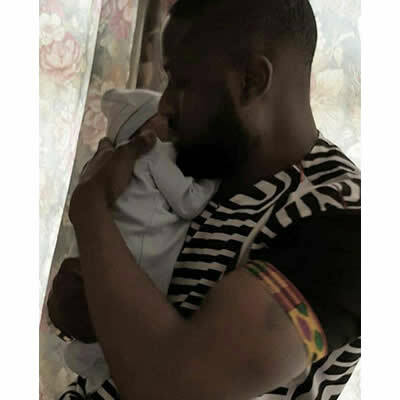 And recently an image of Elikem holding a new born baby has emerged on social media networking sites, raising speculation again. Moles close to the couple, however, say the baby is indeed theirs and is about two months old now. “Pokello gave birth to a baby boy in Harare late last year. His name is Tristen,” said the source. The image in which Elikem will be cuddling a baby was shared on one of the couple’s Facebook fan pages. Followers took turns to congratulate them though many were disappointed questioning why their Big Brother Africa favourites had kept the news away from them. “Ohhhhhhhhhhh my people, how can you hide this from us your fans. Congratulations, I’m so happy for you as if it’s mine. Congrats Pokello and the tailor, Elikem,” posted Oshy Mambathane. But, to add onto the confusion, Pokello has vehemently denied claims that she has given birth or is pregnant saying the baby held by Elikem is his sister’s. “Where do people get such stories from? I don’t have a baby other than Ethan,” said Pokello. Pokello and Elikem Kumordzie got married traditionally at a private family gathering in June last year. They have been constantly in the air, flying between Zimbabwe and Ghana.